First post for a long time. 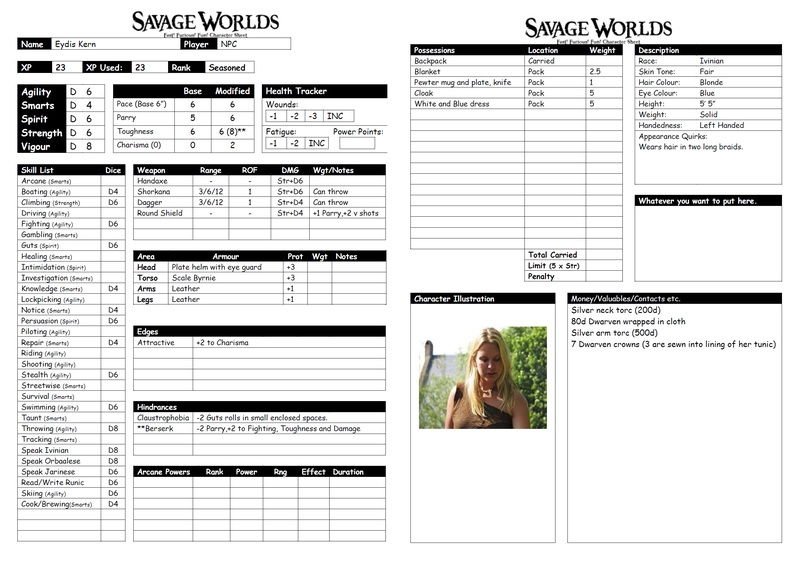 I have made a Savage Worlds Character Sheet. Themed for a Viking-style fantasy role-playing game. File is a PDF. Feel free to take a copy. Email me if you want a Word version. I have a terrible habit of system-changing mid game. Drives my players nuts but does let me try out different systems. It does leave me with a lot of character sheets and sometimes it is interesting to see how different systems treat the same character. I guess it is all relative in the end. This example is a major NPC in my Whale Road Campaign (set in Columbia Games/Kelestia Productions Harnworld setting). This campaign started using Harnmaster 3rd Edition. We have stalled for some years but we are looking at getting started again. Eydis Kern is an Ivinian shieldmaiden. She is best friends with a major PC and friends with all the other PCs (they pretty much all grew up together). 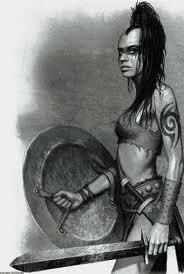 She comes from a very male dominated culture and the path of the shieldmaiden is an out for women who are martially inclined. Her defining attribute is the fact that she is a berserk. She played for nearly a year of game time before this was found out by other players. A blessing from the Gods, or a curse. Not sure yet. 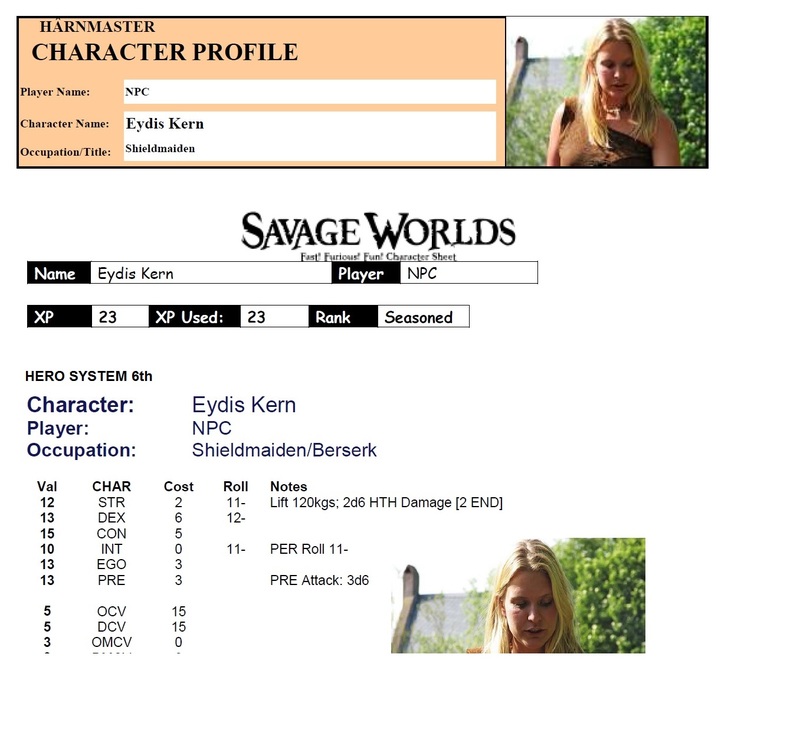 This is her original Harnmaster Character Sheet (the stats page anyway). Harnmaster has a comprehensive generation system that gives a lot of background information. Family, sunsign, foibles. Characteristics are in the 3-18 range and were generated with a variety of 3d6 and 4d6 rolls. She has a few combat skills, and also knows skills suitable for her cultural and social background. Harnmaster uses a d100 Skill system. There are no levels or points – character ability is totally determined by skill. Her berserker rage is shown as a simple plus to the Effective Mastery Level (EML) of her combat skills – in this case +20%. “Lynraal’s Blessing” Aid STR 3d6 (18 Active Points); Only Aid Self (-1), Only When Fighting (-½), Side Effect (automatically becomes Berserk in combat while Aid remains in effect, can only make 11- recovery rolls after all Aided points fade; -½), Cannot Be Used Again Until All Points Fade (-¼) (total cost: 5 points) plus Physical Damage Reduction, Resistant, 25% (15 Active Points); STUN Only (-½), Only When Fighting (-½), Side Effect (-½), Linked (lasts only as long as Aid lasts; -½) (total cost: 5 points). TOTAL COST OF BERSERK RAGE: 10 Character Points. Looks complicated but actually isn’t. What it means is if she goes berserk she gets 3d6 worth of extra strength that slowly fades away each turn. While it is in effect she gets a big reduction in the STUN damage she takes in combat – thus is hard to put her down without killing her outright. Finally, the same character using Savage Worlds. Now I have to say that I like this system for cinematic style games. Stats and skills are based on dice size so range from d4 to d12 (for the most part). Rolls are open ended – roll a 4 on a d4 you get to roll again and add that to your result. Roll another 4 then you add and roll again. It can generate some big effect numbers which can have various game effects. Her berserk rage is handed by a simple add to combat and physical stats and a subtraction from her ability to defend herself. I have been a role-player for longer than I have been a wargamer. Admittedly, as kids in the late sixties and early seventies we didn’t use dice but were more into Live Action Role Playing – fighting off Germans and Japanese invaders in the back yard for the most part. In my teens I discovered what we now call roleplaying – with paper and dice. I was hooked and it has been a hobby that has run alongside my wargaming interests ever since.I have not done much in recent years – much to the chagrin of my RP-friends who keep hassling me to get ‘something going’ again. So…what to play. 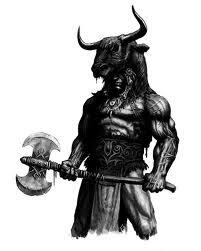 I have had a hankering for a simple Sword and Sorcery campaign – something like Conan the Barbarian. I played around with creating my own world (I am an avid map-drawer since I was a kid) but just couldn’t find the time to get my arse into gear and get something created. I also have pretty much used either the Hero System or Harnmaster for most of the last thirty years and decided that a break from those was required. 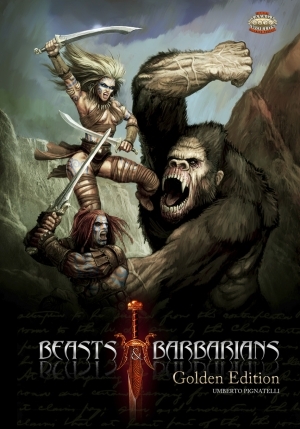 Fortuitously, last year I discovered Beasts and Barbarians, by Umberto Pignatelli. This is a fully fledged fantasy world set in the Dread Sea Dominions. Pretty much all the classic Sword and Sorcery tropes are included, with some nice touches. Steel is a relic metal from an earlier, more advanced civilisation – most people are using bronze and iron at best. Wildebeast riding Black barbarians from the Ivory Savannah fight scaled cataphract riders, fierce Mongol-like nomads call the Valk swarm in from the unknown East, a large decadent Empire (or two) that have seen better days and are now just corrupted shadows of their former selves, and of course, there are black haired, mightily thewed barbarians with smouldering blue eyes from the cold grey hills of the north (and that is just the women). The game uses the Savage Worlds rule set – which if you have not played it is a great, simple set of rules that can be adapted for any genre. They are built around ease of play and the fact that player characters are heroes. They easily chop their way through minions until they are standing in piles of reeking gore, leaving them battered and bruised for the final confrontation with the big bad guy of the session. There are a heap of free adventures available, and a growing compendium of supplements that further flesh out the game world. The entire lot is available as PDF files which is my preferred way of buying roleplaying product now – it takes up a hell of a lot less shelf-space for starters. The artwork is very cool. Some examples. 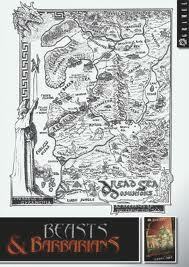 The game book has a simple hand-drawn map that is pretty cool as far as it goes. I decided that the world needed fleshing out. In a form of role-playing solitary vice, I decided to expand the original map and add a bit more of the world (well my version of it anyway). 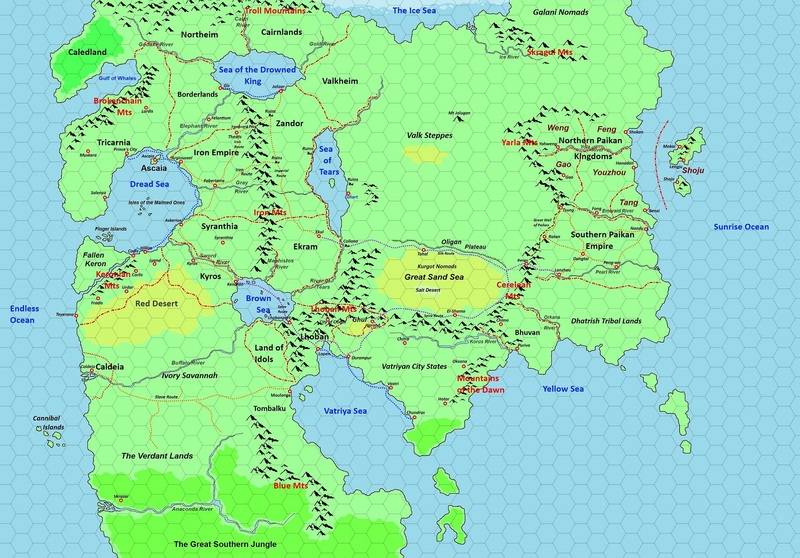 I have not even made a character or NPC up for this game and already I am thinking about mapping the other continents as well. Now I have to get the guys together to make some characters, fill a flagon and get gaming.